I was going to write about sage pesto BUT I got a really bad shot AND this zucchini tart recipe is seasonal and sensational (ah? ah?). This is a really quick and easy appetizer to make when your in a pinch. It can be made with any seasonal vegetables and doesn’t require a whole lot of prep. Sauté your onions until translucent, about 5 minutes. Add zucchini and garlic, sauté for 8 minutes. Remove from heat. Prepare your pastry. Lay a piece of parchment paper on a lipped baking sheet. Place unfrozen (but still cold) puff pastry on baking sheet. Add sautéed vegetables to the center of pastry. 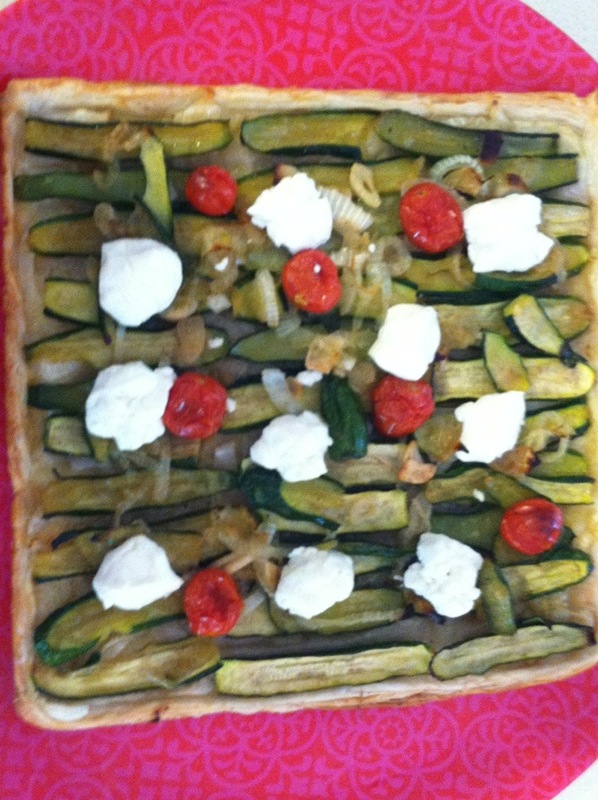 I layered with onions and garlic, then I lined with zucchini. You want to make sure there is about 1/2 inch of pastry around all edges. Brush this 1/2 inch of pastry with egg white. Bake for 20 minutes or until the pastry starts to brown. Add tomatoes in various places to add pops of color to your tart. Now take your goats cheese and roll into 1 inch balls. Place balls around tart (not on tomatoes). Bake for an additional 10 minutes. We sliced in squares. Serve hot or cold.